A freight line could be opened to passenger trains in a bid to prevent Hull from being cut off from other parts of the rail network. The only two routes between Hull and Doncaster will be closed at the same time for more than a month. A landslip at Stainforth, South Yorkshire, forced the closure of the railway line until September. The other line via Selby, North Yorkshire, is to close at the end of July for work on a swing bridge. A collapsed spoil heap at Hatfield Colliery, at Stainforth, pushed the track upwards forcing the line to shut. Essential maintenance work to Selby's swing bridge had been planned two years ago, Network Rail said. The disruption means passengers would not be able to travel to Doncaster or further south via either of these routes. But Network Rail said it would be "using diversionary routes and putting trains along the lines that they don't normally run on" including a freight line between Knottingley, West Yorkshire, and Doncaster via Goole. Phil Verster, route managing director at Network Rail, said: "We work very closely with our freight operators and train operators and we're putting a timetable and a plan together to run services during the period that we're recovering Hatfield. "We are maintaining train services to Hull at the same time that the swing bridge is getting refurbished. "If it turns out that we can't come up with a workable plan, we will consider deferring the Selby works." Mr Verster said the diverted rail route would add an extra journey time of 20 minutes or more. 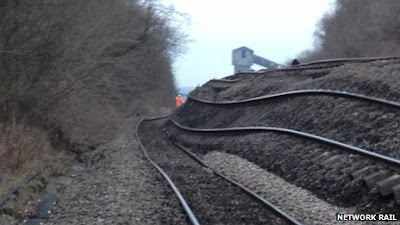 The landslip at Stainforth is affecting First TransPennine Express rail services between Doncaster, Scunthorpe and Cleethorpes and Northern Rail services between Doncaster, Goole and Hull. About 150 replacement buses a day have replaced those services and an amended timetable will run until the track is repaired.